On whose soul / may the Lord / have mercy Amen. Brightwalton War Memorial – Dedication Service, 17 Nov 1916. 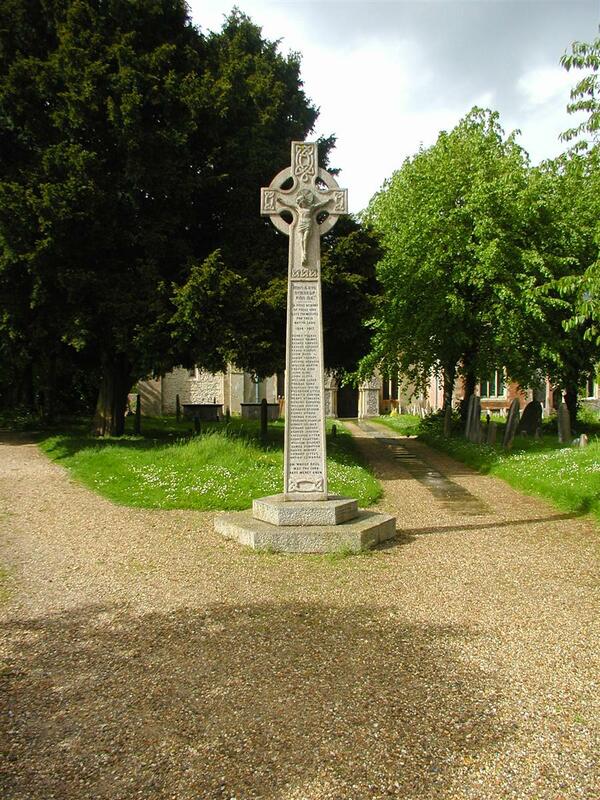 Friday, November 17th, 1916, will ever be a memorable day in the annals of the united parishes of Brightwalton and Catmore, for on that day the Bishop came to dedicate the Village Cross, recently erected to the memory of those who fell in this great War. A very loyal response was made to Lord Kitchener's call by the men of these two villages, the Roll of Honour containing 64 names of volunteers out a population of less than 400. Seven, including two sons of the Rector (the Rev H F Howard) have been killed, and many of the remainder are now in the thick of the fight. "In pround and affectionate remembrance of Bernard Henry Howard, Major, 47th Sikhs, and Henry Charles Mowbray Howard, Lieut York and Lancasters, and others of this village who have given their lives for their country." "Be though faithful unto death, and I give thee a Crown of Life." The hymn, "Hark the sound of holy voices," was sung as the procession wended its way, and when all were grouped round the Cross the Rector petitioned the Bishop for its dedication in the following words:- "Rev Father in God, I pray you to bless this Village Cross which we have erected to the memory of the men who fall in this Great War." The Bishop proceeded to do so using some very beautiful prayers and reading out the names of the fallen, viz:- Ernest Blackford, Royal Berks; James Hazell, Royal Berks; Bernard Henry Howard, Major, 47th Sikhs, Indian Army; Henry Charles Mowbray Howard, Lieutenant York and Lancaster Regiment; Harold Jordan, 29th Canadian Light Horse; George Maskell, Royal Berks Regt; Leonard Painter, Royal Berks; and saying a commendatory prayer. The procession then returned to the Church singing "Onward Christian Soldiers," and the Bishop conducted the final service of the National Mission, which has been carried on in various ways in these two parishes, since the close of harvest. The Cross in if great interest in itself, the foundation surrounding pavement and part of the base being formed of old staddle stones taken out of the School wall during some renovations. On this rests the base of the ancient Village Cross, which stood in the old Saxon Churchyard. The shaft is new, but the Cross itself was taken down at the rebuilding of a neighbouring church some 40 years ago, and, not being required, was about to be destroyed, but eventually it came into the possession of the Rev H F Howard, who has preserved it all these years, and now restores it to its former sacred use. On the base the following inscription is carved:- "To the glory of God and in memory of the men who fell in the Great World War, 1914-19--"